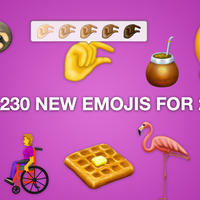 Special new emoji edition as 230 new emojis have just been approved for phones in 2019. Can three year-olds use emojis to communicate, whats up with WeChat, and poor David Tennant. Meet the designers of Apple's original emoji set which turns 10 today. And has it really not even been a month since Bagelgate? 158 new emojis in iOS, Microsoft also had a big day. And is that bagel so bad? Poo and maps don't mix, Facebook is getting glossier emojis, and what about a period emoji? What happened on World Emoji Day, and when your phone is getting the new emojis. What's Happening on World Emoji Day, a chat with Google's Jennifer Daniel and is a poop emoji hate speech?